Mary Beth Latham is first and foremost a mother, whose three teenaged children come first, before her career as a landscape gardener, or even her life as the wife of a doctor. Caring for her family and preserving their everyday life is paramount. And so, when one of her sons, Max, becomes depressed, Mary Beth becomes focused on him, and is blindsided by a shocking act of violence. 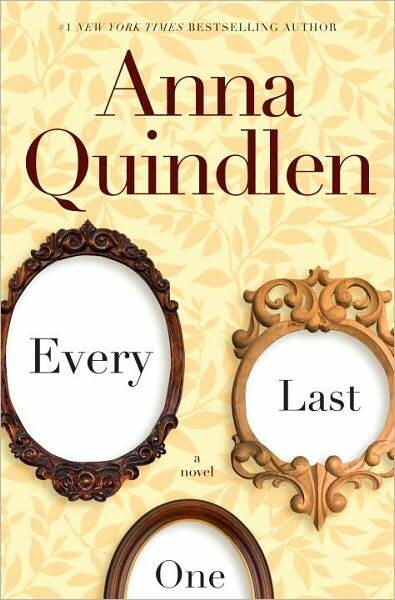 The first half of Every Last One by Anna Quindlen follows an ordinary suburban family in the mundane routine of their everyday life. Mary Beth Latham is the narrator. She runs a landscaping business and is the wife of Glen, an ophthalmologist. Most importantly, however, she is the doting mother of seventeen year old Ruby, and fourteen year old twins, Max and Alex. When Ruby breaks up with her long-time boyfriend, Kirenan, Mary Beth is concerned, but she is much more focused on the depression of her son Max, who is feeling overshadowed by Alex's athletic abilities and accomplishments. Over half way through the novel an act of violence occurs that irrevocably changes Mary Beth's life. While Quindlen is a very good writer, I just have to say that the first half of this novel bored me to tears and the characters annoyed me. There - I've said it. I knew from the descriptions of this novel that there would be a huge twist, but man did Mary Beth and her friends annoy me. I guess I might as well admit that I would not seek a friendship with any of these women - before or after the tragedy - and that does color my feeling about Every Last One. Also it seems that someone would notice Kirenan's odd behavior. So, I kept reading the novel long past when I normally would have set it aside knowing that there was a big plot twist coming. Was it worth it? Um... yeah, I guess. The writing is quite good. Even if Mary Beth and the other characters annoyed me, the quality of the writing kept me reading. The second half of the novel actually redeemed the first part. “Okay, okay,” Alex says irritably. Max says nothing, just lurches from bed and begins to pull off an oversized T-shirt as he stumbles into the bathroom. I had VERY similar feelings after reading this book. I can't remember how I felt about the characters, but I definitely remember the first half being SO BORING! Three things kept me reading: the quality of the writing,I knew there was a huge plot twist coming, and other reviewers loved it so much. But we agree, the first half was, SO BORING!